[Guide] [Mini-game] [Devil Square] <+> [MU Online Fanz] <+> Official 3rd-party [MU Online] Fan Site & Game Guide! [Devil Square] is a developed training arena which entraps the [Immoral Tree]. During specific intervals throughout the day, evil monsters are spawned from the [Immoral Tree]! Once considered a burden of war, this place is now a popular training ground for adventurers! There is no penalty upon death in this [Mini-game]. 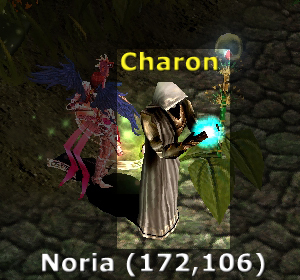 Talk to NPC [Charon] to enter [Devil Square]. In MU's history, the [Elf Tree] once stood in [Noria]. Essentially, the tree still stands to this day, but now relocated. The [Elf Tree] was created by the Queen of all Elves, known as [Aria]. This tree, a sacred ancient monument, had the ability to produce [Elves] regularly. Unfortunately, with time, [Secrarium] learned of the tree's great ability. Through dishonest tactics, he tricked [Lugard] into revealing the location of the [Elf Tree]. Having set his eyes on the tree's power of birth, [Secrarium] corrupted the tree and transformed it into what is now called the [Immoral Tree]. The [Immoral Tree], now corrupt, gives birth to monsters. The monsters horde grew to astronomical proportions, and the kingdoms of the MU continent had to combine their forces to entrap the [Immoral Tree] in a space of nothingness, where monsters could not escape. Monsters continued to spawn at regular intervals, from the tree, however after careful consideration [Aria] decided to make it a training arena for travelers. [Party] is allowed and can be formed inside the [Devil Square] map. Any character with a [PK Status] cannot enter the [Devil Square] map. The arena is a large square, with [Guards] surrounding the entire arena. When started, 200 monsters will instantly spawn throughout the arena. If a monster is killed, another will spawn to keep the monster count at 200. As the time progresses, the monsters which spawn will change and their difficulty will slightly increase. Avoiding large quantities of monsters by using [AOE] [Skills] can help avoid taking [DMG]. [Event Points] are earned when a monster is killed. The amount of [Event Points] earned per kill is based on the target's [Monster Level]. The [Mini-game] is won by earning the most [Event Points]. [EXP], based on [Event Points].